5 years ago I would have written this article in a very different way. 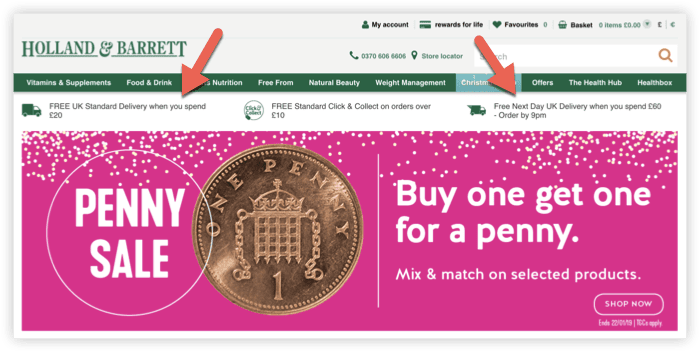 If you would have asked me how to increase your ecommerce conversion rate back then, I would have probably told you that you should focus on site design and 1-page checkouts. Why am I not suggesting the same today? Because you already have a beautiful website with a 1-page checkout, right? If you’re using a platform like Shopify or Bigcommerce to host your website, you’ve basically got all of this stuff right out of the box. All Shopify stores come with a highly optimised, 1-page checkout which is better than anything you’d be able to make on your own. And any Shopify theme you use for your store is probably already frickin’ beautiful with CTAs in all the right places. 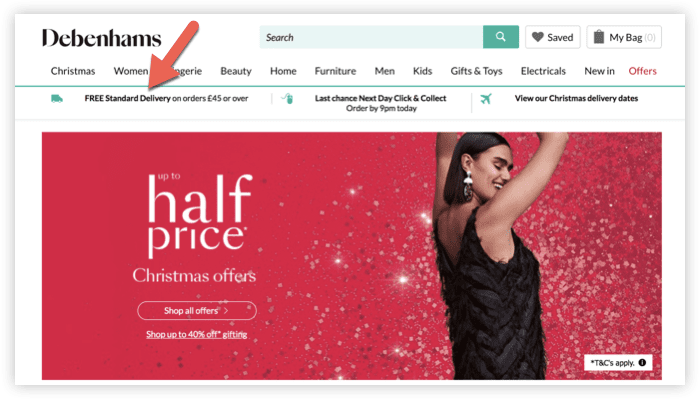 Well, just like 5 years ago, there’s now a new set of things that you should be doing to your website if you want to increase your ecommerce conversion rate – or at least have a very good reason not to! Why you should be focusing on ecommerce conversion rate? Whenever I start work with a new client, I always begin by looking for gaps in their marketing – things they’re not doing that they should be. “Quick wins” for want of a better phrase. After years of working with over 30 businesses, I’ve come to learn that there are certain things that will always get results. 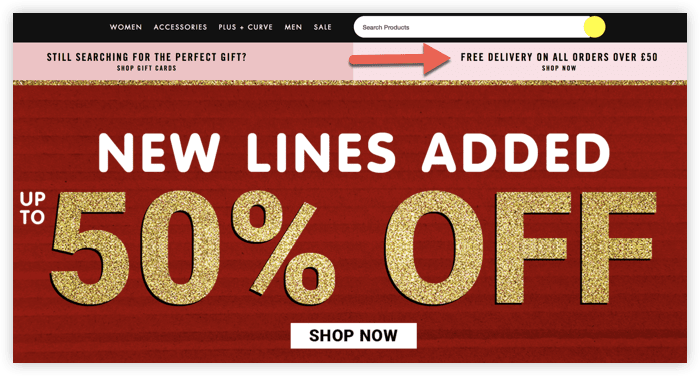 They’re not fancy, growth-hacking strategies; just a simple set of marketing tactics that provide the foundation for a great ecommerce business. When you build a house, if you don’t lay down good a good foundation to begin with, you’re going to end up spending far more money than you need to on structural repairs in the future. If you don’t have the foundations in place, you’re going to end up spending more time and money than you need to on all your other marketing efforts. Those tactics are what I’m going to be sharing with you in this post. In a hurry? 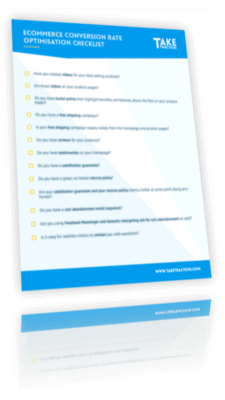 You can download my ecommerce conversion rate optimisation checklist here. There are so many metrics to focus on when you’re running an ecommerce business. It can seem a little overwhelming at times. But conversion rate is by far one of my favourites. In simple terms, because it’s easier. Think of it like this. Let’s say you’ve got 10,000 monthly visits and a 1% conversion rate. What sounds easier, getting an extra 10,000 visitors or increasing your ecommerce conversion rate 1 percent? Both options will double your sales. But a few small tweaks to your website could be all you need to double sales in the next 2 days! For those of us who are new to this metric, calculating your conversion rate is nice and easy to do. You just take your total unique sales for a given time period – say, 1 month – and then divide it by the unique visitors for that same time period. Let’s say that last month our store had 150 sales from 10,000 visitors. Our conversion rate would have been 1.5%. If you have ecommerce tracking set up in Google Analytics, you can also find this number by heading to Conversions > Ecommerce > Overview. Using Shopify? Find out how to set up ecommerce tracking here. You can also find your conversion rate directly within the Analytics menu on your Shopify backend. All that matters is that you always use the same method of finding out your conversion rate, since different sources may calculate it in slightly different ways. So before you start trying to improve your ecommerce conversion rate, you probably want to know what you should be aiming for. Well, let me just start by saying that conversion rates vary greatly, depending on the industry and type of product you’re selling. A lot of the stats available online can be quite unreliable as well, since most of them include ecommerce stores that haven’t been in business that long, or maybe just aren’t doing a good job with conversion rate optimisation. Andrew Youderian, founder of ecommercefuel.com, ran a survey in 2017 to create a report called, the “State of The Merchant Report”. In the report, he analysed data from hundreds of high six and seven-figure ecommerce businesses – people who know their sh%t! The overall average was 2.1%, but values varied greatly across different locations and industries. Some were as low as 0.5% with others just north of 5% on the high end of the scale. Generally speaking, 2% is a good conversion rate for ecommerce, but you should always aim as high as possible. Anything below 2%, in my opinion, is either a bad conversion rate or just a very bad business model. Want to find out how much opportunity you’ve got to instantly increase your ecommerce conversion rate? Can you remember last time you walked around town looking for somewhere to have dinner? You see a fancy looking restaurant so you walk up to it and check out the menu. The food looks amazing and the place looks pretty snazzy. But as you glance over to your right, you see another restaurant across the street. The restaurants themselves look fairly similar, only the one across the street is buzzing with people as they go about their evenings. You can hear the clunking of cutlery and the gentle hum of people chatting as friends, couples and relatives catch up on the day’s events. Looking back at the restaurant in front of you, you see a lonely couple sitting quietly in the corner as they eat their dinner. Tell me, which restaurant did you choose? Obviously you choose the second one! There was no real difference between the two. In fact, the second one might have looked a bit less fancy than the first one and the menu might not have looked as good. But you still chose the one that was full of people enjoying themselves. Why? Because it had social proof. You see, social proof is incredibly powerful. More powerful, in fact, than product and website quality. Of course, you’ll probably need an amazing product with a good looking website if you want to get social proof in the first place. But social proof will always beat anything else. Ever seen a run-down restaurant full of people? Ever been on a popular website and been surprised by how bad the design is? I see these two things all the time and there’s one good reason why they still beat the competition despite being ugly A.F. – social proof. 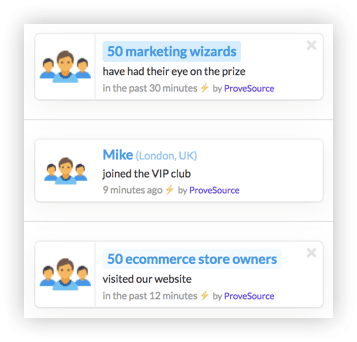 Reviews – The bread and butter of social proof. No one wants to be the first person to buy something. And no one wants to buy something without first getting an idea of how good it is – especially online. Amazon realised this decades ago and that’s why they pretty much built their entire ecommerce business around reviews. Testimonials – The brand equivalent of a product review. While reviews let visitors know about the quality of the product, testimonials allow you to show potential customers how much of a great experience it is to do business with you. Proof Popups – These have taken off in recent years and honestly, I think they’re fantastic. Little popups that tell visitors what other shoppers are doing in real time. This is the perfect restaurant “buzz” effect. I’ve tried out a few of these but ultimately Prove Source is the one I settled on. Years ago, Dr James McQuivey coined the term “a minute of video is worth 1.8 million words” in a Forrester Research Report. What? How the F did he work that one out! Well, you know the popular saying “a picture is worth a thousand words”, right? Times that by 30 frames per second and you’ve got 30,000 words in a second. Times that by 60 and you’ve got 1.8 million words in a minute. Therefore, a minute of video must be worth 1.8 million words, right? Obviously, you should probably take that with a pinch of salt. Of course it’s not literal. It’s just a figure of speech. But the concept behind it still stands true. And there are some pretty impressive stats to back it up. If you’re not using video, your conversion rate isn’t as high as it could be. Period. Full stop. Case closed. 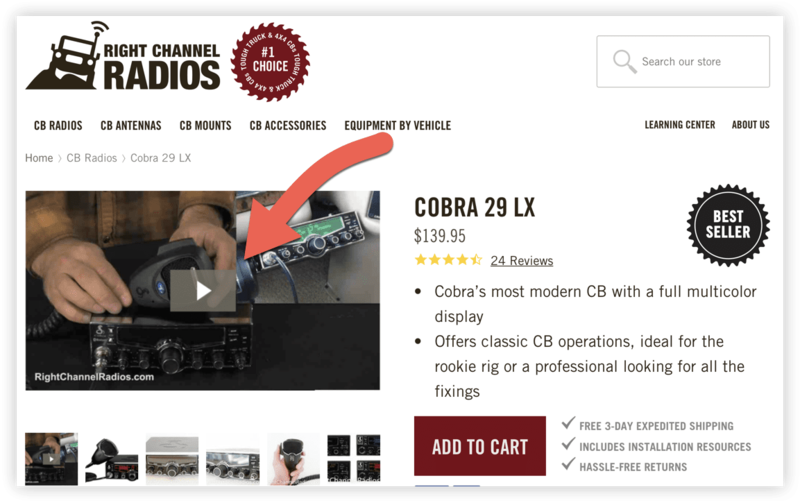 Try including videos on your product pages to demo the use of the product or highlight the features. It doesn’t have to be fancy. People don’t just want to buy great products. They want to buy great products from great brands. The homepage is a great place to show off your brand to give people the confidence to buy from you once they end up on a product page. Try creating a video that shows your audience who you really are. People love people far more than they love brands. Even more so, they love people that they can relate to. Human beings are social creatures and we have a constant desire to feel like we belong to a community. The Beard Club does a great job of making their customers feel like part of a tribe with all of their messaging, including their homepage video. You don’t literally have to say “join the club” like they do. But ultimately this is exactly what you want people to feel. Don’t be scared by the quality of this video. You don’t need to spend the time or the money to create something as advanced as this. Keep it simple and be genuine. You can record it on your iPhone if you need to. Use stock footage from Envato as well. Or maybe consider finding an agency to make it for you. But honestly, if it’s your first video, just make it yourself and record it on a phone. That way you can make more expensive videos once you have a better idea of what works. Email has always been one of the most powerful marketing channels there is. But inboxes are swarmed with promotional messages and open rates are dwindling. That’s why you need to make your emails as engaging as possible. Video is a great way to do this. In fact, a report by High HQ has shown that using the word “video” in the subject line of an email can boost open rates by 19%. What do you want people to do once they actually open your emails? Click through to your website, of course! Well, since you can’t actually put a video in an email, you can just add a thumbnail image that looks like a video and link it to a page on your website where you can host the video and add whatever other marketing material you wish to. It’s hardly surprising that Martech Advisor found that adding videos to your email can increase click-through rates by 300%. Abandoned cart campaigns aren’t exactly a new concept. But again, they’re absolutely fundamental if you want to increase your ecommerce conversion rate. The Baymard Institute did a meta-analysis of 40 different studies on ecommerce cart abandon rate and found that the average rate is 69.89%. Yes, nearly 70% of all people that add products to their shopping cart end up not making a purchase. Think of how much money you’re missing out on! Abandoned cart emails are obviously a great place to start. There are a bunch of apps that can help you do this, or you can just use Shopify’s built-in cart abandonment feature. Why stop with emails?! After all, open rates aren’t exactly great these days. Try using Facebook Messenger to increase your open rates and recover more of those abandoned carts. Want to step it up a level and get pro with your abandoned cart campaign. Try creating dynamic cart abandonment ads on Facebook. Do this alongside emails and Messenger notifications for the best results. In a world where people can buy almost anything they want from Amazon, how are small ecommerce store owners supposed to compete with them? People trust Amazon to deliver their orders fast and they know that if they want to return it for any reason, they’re not going to have any difficulty doing so. This is now the bare minimum that people expect when they shop online. So if they have any reason to believe that you might not be as easy to shop with as Amazon, your ecommerce conversion rate is going to suffer. That’s why it’s important to highlight all of your guarantees and returns policies. Say it loud and say it clear! Put badges on the homepage, in the header, on the product page… wherever you can! The clearer you make it, the more your visitors will trust you and the higher your ecommerce conversion rate will be. 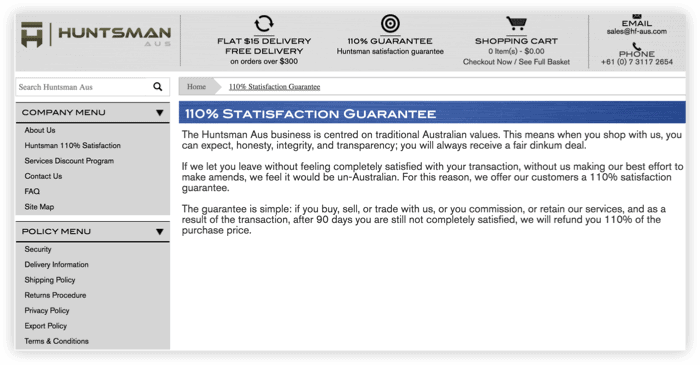 Try using a 110% guarantee. If your product is good, very few people will actually take advantage of this, but it will be a massive confidence booster for people on the edge. I’ve used this on my own stores in the past and it’s given me some great results. Any claims I had were totally worth it for all the extra sales it got me. Obviously, you’ve already got product descriptions. But are you doing them in the best way possible? Your product page is the most important page in your entire ecommerce funnel. Yet most people rush them and don’t pay attention to the details. 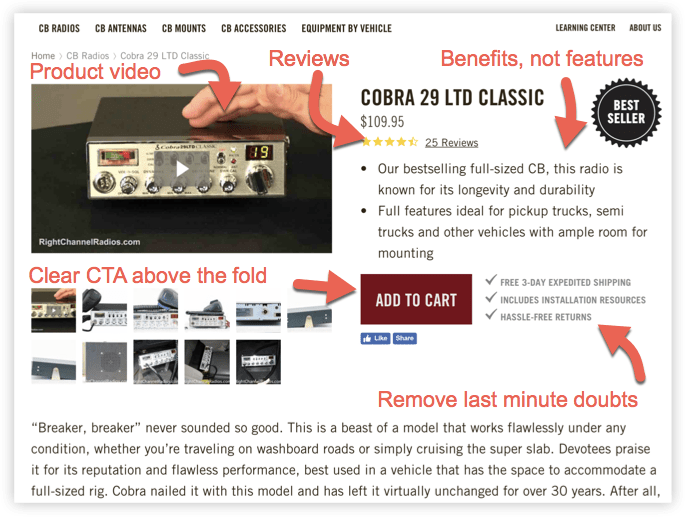 The best way to optimise your product page is by studying what Amazon does on theirs, since they’ve probably spent hundreds of thousands of dollars testing and optimising every detail. Notice how they only allow sellers to use bullet points above the fold. No big blocks of text. That’s because people want to quickly understand if the product is right for them or not. They certainly don’t want to read an essay that goes over every feature of the product. Not at first anyway. 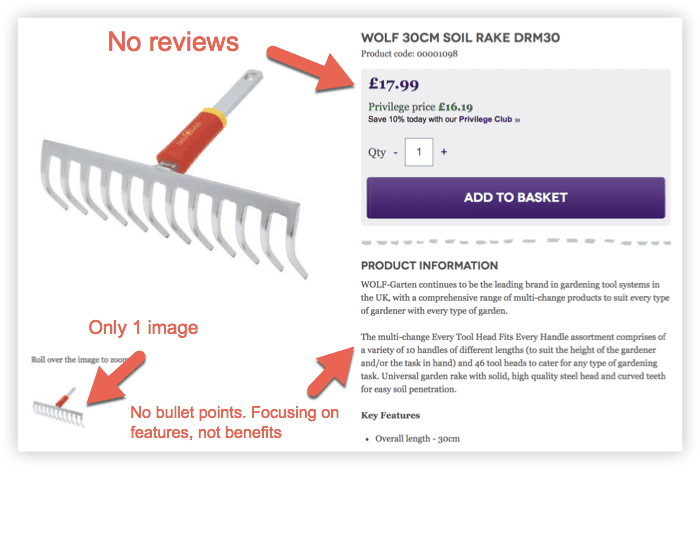 If your theme allows it, show bullet points above the fold and a main product description paragraph below the fold. I use Right Channel Radios a lot as an example of a highly optimised website for ecommerce conversion rate. Notice how they use bullet points to highlight the benefits right above the Add to Cart button. If these benefits sound good to someone viewing the product, they can then scroll down if they want to find out more. But if they’re ready to buy then heck, let them buy! Notice how they don’t even talk about the product for the first paragraph. And then when they do start talking about it, they jump straight into the features and forget about the benefits. What’s the benefit that someone gets from using this rake? Do they get the job done quicker? Do they avoid having problems with rusting tools? I’m sure there’s something they could put into a couple of bullet points to make this product page 10 times better. If there isn’t a benefit, then you probably shouldn’t be selling it in the first place! We live in a Prime world. People expect free shipping. If you’re not offering it, there are people that are deciding not to buy from you. People spend more money with companies like these than they do with you. Therefore, if you want to increase your ecommerce conversion rate, free shipping is a must. A 2017 report from Walker Sands found that four in five consumers (80%) say that free shipping would incentivise them to shop more online. Remove the friction by offering free shipping and you’ll see your ecommerce conversion rate soar! Before you start panicking, you don’t have to give free shipping to everyone. And it doesn’t have to cost you money either. Setting up free shipping campaigns with a minimum cart size for people to qualify for free shipping is a great way to increase average order value as well as your ecommerce conversion rate. 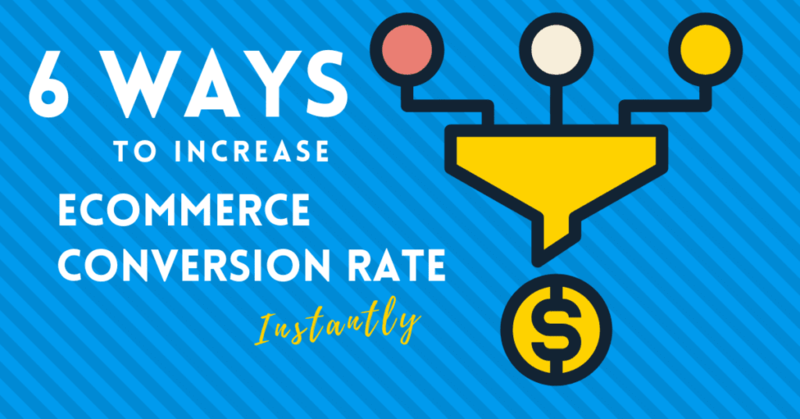 So there you have it… six simple things that will instantly increase your ecommerce conversion rate. Got any questions about CRO? Leave a message in the comments below!